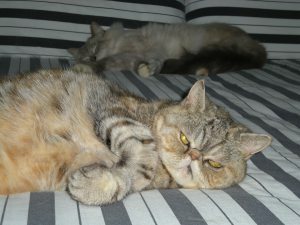 Beautiful story of a new mama who lost her babies. 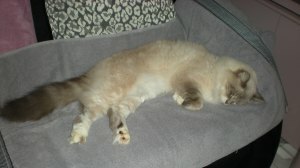 Mikey, an eight month old cat, was inconsolable. 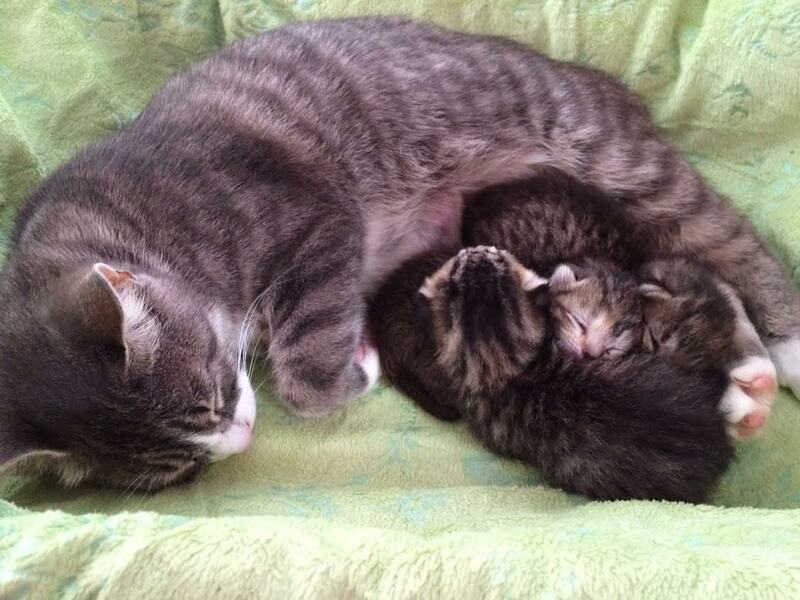 She had three kittens, born too early. They were weak and one by one, they died. Mikey’s owner Hillary tried everything she could think of to save the babies. After the last of Mikey’s kitten’s passed away the cat was searching frantically for her offspring, acted very depressed, and her breasts were engorged with milk. Favorite spots seem to keep changing. I think this one is a keeper! Pussycats 3 is a busy place. The three of them are continually changing their preferences. I noticed Romeo seemed to want to spend more time lately on the couch (he’s smart) than on my desk (it gets crowded many times as you have seen in previous posts). So, using good ol’ human ingenuity, I solved that problem. 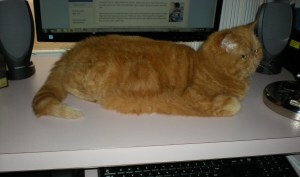 Now, Rusty has the desk all to himself!! Where there’s smoke, there’s most likely fire. Now, this is the type of police work I like to hear about. Maybe we should send our police recruits to Sweden for training?? 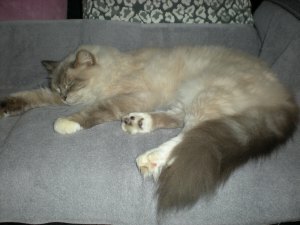 In my opinion, Patches is beautiful whether sleeping, half-awake or fully awake!! I guess I wasn’t quiet enough. 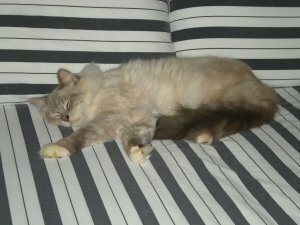 I wanted to take a photo of Patches while she slept – she looked so beautiful! But, she caught me as I caught her, half awake. 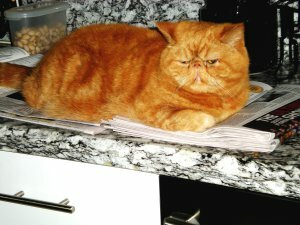 Newspapers – sometimes the best cushion. 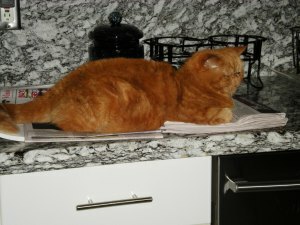 When I’m in the kitchen, Rusty likes to be near, and it doesn’t matter where he parks himself. This time, he found a wonderful cushion of newspapers. Feels just right. How could I forget about Romeo when it comes to having a conversation about relaxation? He’s one of the most experienced on that subject. “Mr. 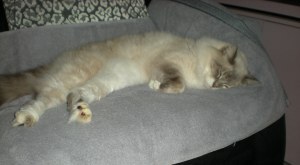 Handsome” is no slouch in the relaxation department. A more frequent favorite place is on Mom’s bed in the afternoon. Chef Joan Cheever has been feeding the homeless in San Antonio TX, once a week since 2005. She has been ticketed for her illegal activities, which carries a $2,000 fine, and plans to fight this at her court appearance in June. Chef Cheever is cited for feeding the homeless in San Antonio TX. How is she going to fight it? What is her argument? Religious freedom. This is her way of praying – to help the needy. Yes, this is the first time I’ve read about using this argument for a citizen’s activities for a good purpose.